Few Jews today should have missed the lessons of the Dreyfus affair a century ago. Dreyfus, a French Jew, was a captain in the upper ranks of the French military. In 1895 he was convicted of being a spy, though he vigorously denied it. Systemic anti-Semitism and his being the only Jewish officer at his rank both played a huge role in his conviction. Despite evidence that another officer was in fact the spy, at a second trial in 1899, Dreyfus was again convicted. Jailed for years on the remote Devil’s Island, he became a broken man both physically and emotionally. Leading French intellectuals, artists and writers (including Emile Zola) rallied to his cause and protested Dreyfus’ convictions. In 1906 he was finally freed, and exonerated. There are some similarities between the Dreyfus Affair and the case of Hassan Diab. Canadian Hassan Diab is finally free – in part thanks to many individuals and advocacy groups that worked for years to demonstrate the flaws and inconsistencies in the evidence against him, and that demanded a halt to his extradition to France. Diab’s six years of house arrest and three years in a French prison were outrageous injustices meted out to a man who had committed no crime. Lebanese-born Canadian Hassan Diab was a marked man ever since once he was named as France’s only suspect in the 1980 bombing of a Paris synagogue that killed four people and injured 40. Since 1999, French police had set their sights on Hassan Diab whom they believed was a terrorist involved with a Palestinian group, Popular Front for the Liberation of Palestine (PFLP). But the French police could not clearly prove this. They said Diab’s was the same handwriting as the bomber’s and that an identikit photo proved it was Diab. However handwriting experts confirmed that Diab’s handwriting did not match the five handwritten words on a hotel registration card thought to belong to the bomber. Though a woman in Paris identified the attacker as between 40 and 45 years of age, Diab was only 26 at the time, a student writing exams in his university in Beirut. His presence at the university was corroborated by affidavits from other students and from documents sent by the university. The fingerprints and palm print on evidence found by the French police were not the same as Diab’s. Nonetheless, despite linking Hassan Diab to the crime, in November 2008, France demanded his extradition to stand trial for the murders. Diab was arrested by the RCMP in Ottawa where he lived. He taught sociology at both Carleton University and the University of Ottawa. The Canadian court had imposed very strict bail conditions. For example, his wife, Rania Tfaily, also a sociology professor at Carleton, had to accompany him twice a week to campus when he taught his class; he had to wear an electronic ankle bracelet (which cost him $2,000 a month); he had a curfew and had to live under house arrest when not at work. He was forbidden to own a cellphone. In June 2011, Justice Robert Maranger ordered that Diab be extradited to France. Maranger did have misgivings; in his words the case against Diab was “convoluted”, “very confusing”, “with conclusions that [were] suspect”. Appeals to the extradition decision were denied, and Diab was extradited to France in November 2014. For the last three years, Diab has been in solitary confinement awaiting trial in a maximum-security prison on the outskirts of Paris. Though some French magistrates were convinced Diab was the wrong suspect, the prosecutors seemed desperate to pin the crime on him. In 2009, at a hearing in connection with the extradition, Diab’s lawyer explained that Diab intended to return to teaching at Carleton University. According to media reports, the next day an Ottawa-based member of B’nai Brith called Carleton University to complain that Diab was still teaching there. Later that day, Carleton fired Diab, who was three weeks into teaching an introductory sociology course at the University. Even before Carleton University came out with its statement, B’nai Brith Canada, commended the university for having done the “right thing” in not allowing Diab to teach. In their statement, B’nai Brith Canada said it was “deeply disturbed” by the news that the alleged bomber would be permitted to teach. Dimant’s key worry seemed to be that Diab would make anti-Jewish slurs against Jewish students – this despite the fact that Diab had never been accused of uttering a single anti-Semitic sentence. B’nai Brith Canada describes itself a human rights organization which has “championed the cause of human rights in Canada since 1875.” Their YouTube site displays the motto: “Grassroots human rights advocacy and a lifeline for our community.” B’nai Brith’s League for Human Rights, “advocates for the human rights of all Canadians… and advocates for global human rights…”. 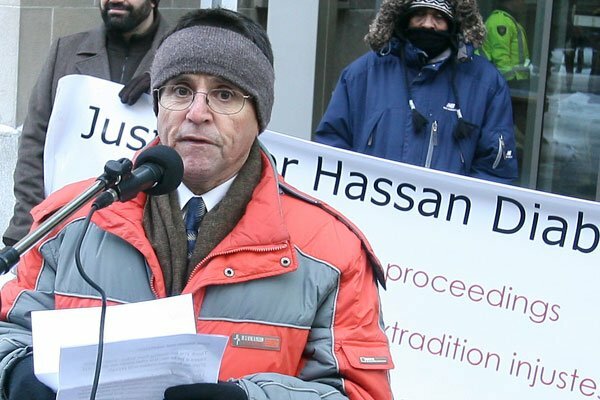 If B’nai Brith and its League for Human Rights advocates for human rights, what about the rights of Hassan Diab? Isn’t a basic tenet of all human rights the right to be presumed innocent until proven guilty? Clearly B’nai Brith is extremely selective about its human rights advocacy. B’nai Brith might be quick to point out that they merely wanted the process to go ahead. In other words: let Diab be extradited to Paris for a trial– but all along the way there were signs of a weak and problematic case against him. B’nai Brith seems to have missed the lessons of the Dreyfus affair a century ago. Just as it was convenient for the French to scapegoat Dreyfus, it was convenient for B’nai Brith to scapegoat Diab. It was in B’nai Brith’s rush to judgement that they zeroed in on Diab, an Arab, to blame for the synagogue attack. Not only did B’nai Brith ignore the unconvincing legal case against Diab, but B’nai Brith hardly complained when he was put under house arrest and incarcerated without trial for years. And five days after Diab was freed of all charges in France, and a day after he returned home to Ottawa, B’nai Brith has said nothing publicly. B’nai Brith owes Dr Diab and the Canadian public an apology. At no time did B’nai Brith seek to make common cause with well-respected social justice and advocacy groups such as Amnesty International, the Canadian Association of University Teachers (CAUT), the Canadian Civil Liberties Association, the BC Civil Liberties Association, the International Civil Liberties Monitoring Group, and the Canadian Labour Congress – to name a handful. They all demanded justice for Diab. Two Jewish organizations supported Diab – the United Jewish People’s Order, and Independent Jewish Voices-Canada. IJV-Canada has supported Diab from the start and demanded he be freed. IJV-Canada joined with other Canadian advocacy groups to expose discredited evidence and the Canadian government’s complicity in allowing Diab’s extradition. The way the Canadian government handled the Diab case is eerily reminiscent of its bungling of cases involving other Arab-Canadians including Maher Arar, Omar Khadr, Muayyed Nureddin, Abdullah Almalki and Ahmad Elmaati. All were tortured in foreign countries as a result of faulty Canadian intelligence and the refusal by our governments of the day to intervene. All have since been issued with apologies and compensation. Will Hassan Diab be the next?